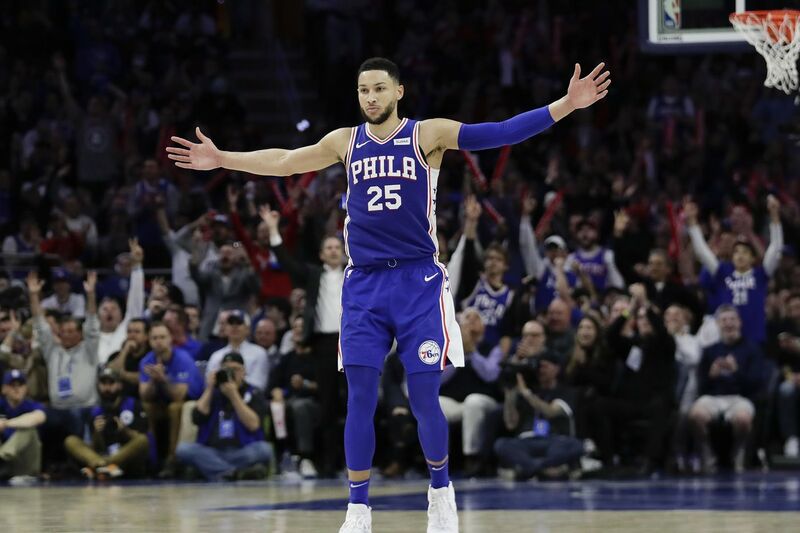 Ben Simmons waves his arms after a fourth-quarter basket during the Sixers' 145-123 win in Game 2 of their first-round playoff series against Brooklyn. There was blood between his knuckles and a throb in his jaw, but there wasn’t a hint of admission on Ben Simmons’ face that he’d rather have the circumstances any other way. He’d entered the night in thick of one of those periods of tribulation that all burgeoning stars inevitably face. First came an abysmal performance in Game 1. Then came this city’s cardinal sin, when he responded to a question about the home crowd’s booing by saying something other than, “Thank you, sirs, may I have another?" The stage, then, was set. This was an inflection point, both for a team that had been thoroughly outplayed by an underdog opponent on its own court, and for a young star who will need much more than a single All-Star selection to silence the whispers that he is something less than what the sporting press has cracked him up to be. This was Game 2 of an NBA playoff series, which meant that the only thing thicker than pollen in the air was boxing analogies. A couple of hours before tipoff, Nets coach Kenny Atkinson said that he expected the Sixers to come out throwing haymakers after their ugly loss in the opener. What he could not have envisioned was the way they’d respond to the punches they themselves had thrown. By the end of the third quarter, the decision had been rendered, a 51-point explosion breaking open wide what would end as a 145-123 win. The hype surrounding this Sixers team was built on a foundation more substantial than paper. And, for at least one night, their second-year point guard was the keystone. He could have shriveled. With Jimmy Butler spending considerable time creating off the dribble, Simmons could have reverted to his Game 1 form, lost in a purposeless drift. Instead, he elevated his game to the exact height the Sixers needed, whether on or off the ball. From the opening tip, he attacked the rim with abandon whenever he saw the potential for a lane. And when he didn’t? He contributed in all of those other ways that make him who he is. For 30 minutes, Simmons treated the Wells Fargo Center crowd to an exhibition of his remarkable package of traits. There’s his vision, one of those unteachable traits that can open up a defense regardless of where he is stationed on the court. You saw it late in the third quarter, when he spotted an open shooter in his periphery even before a pass into the paint arrived. He had the ball in his hand for less than a second, tapping it out to Mike Scott for a knockdown three. There’s his length: In the closing seconds of the period, he batted a missed Sixers shot away from Nets forward Treveon Graham and into the open arms of Scott, who lobbed it through the rim at the buzzer to extend the lead to 116-87. There’s his body control, something you saw when he chased down an errant Nets pass on the sideline, tapped the ball back into play before stepping out of bounds, then chased it down on the other side of the midcourt line to set himself up for a fast-break layup. But there was also something else, something a little more subtle, the sort of thing that can’t be explained with stat lines and measuring tape. If anything, those sorts of quantifiable things have served as a burden throughout Simmons’ first two years in the league. There have been allegations of a certain hollowness to his stats, a school of thought that says a 6-foot-11 player with his innate gifts should be something more than he’s been. On Monday night, there was nothing empty about Simmons, from his lockdown defense on D’Angelo Russell to his integration in the Sixers’ half-court offense. Even his triple-double stat line did not do the performance justice. Not just from an individual standpoint, but from the way it allowed his teammates to do what they do best. Running the point -- a role that was his alone with the second unit, as T.J. McConnell slipped out of the rotation -- Butler thrived. There was a moment early in the Sixers’ 51-point third quarter when Joel Embiid was setting up shop above the low block, and Butler was standing in the backcourt, barking at a referee for a defensive three-second call on the help-side defender lingering to the big man’s rear. After another tick or two, the whistle blew, and the ensuing JJ Redick foul shot added another drop to the deluge that the Sixers were in the process of unleashing to start the second half. It was the exact sort of mixture of skill and confidence and guile that the Sixers needed. But unlike at Butler’s previous stops, his young compatriots took advantage of the shadow. Give credit to coach Brett Brown for recognizing what needed to be done. But give a double dose to Simmons. He embodied all of the adjectives you needed to see: aggressive, physical, smart, relentless. The result was a pivotal win for the short term, and a renewed faith in the franchise’s long-term future.